- The series consists of 18 basic pieces (Rarity & Ratios listed below for reference). - Designers in this series include Candie Bolton, Bwana Spoons, Chauskoskis, James Groman, Jeff Lamm and Jon Rampage (Rampage Toys). - Suggested Retail Price (SRP) per blind box is US$11.99. - Each "case pack" includes 24 x blind boxes. SWIPE thru above IG-slideshow to view Dunny designs from Candie Bolton and Jon Rampage - which showcases overt re-sculpted elements to the basic Dunny form. "I’m super honored to be included in this series with so many awesome artists!!" mentioned @candiebolton. You might recognise Candie's "Baku" being a part of her "OH MY! YOKAI Legendary Beats" gacha-line (with Toy Art Gallery), and is also being produced by Pobber Toys into a larger vinyl toy = expanding her interpretation of Japanese folklore unto collectibles! Jon Rampage's "Ugly Unicorn" gets the Dunny interpretation, and the design for "Kesagake Bear" and it's "accessory" leaves a huge smile on my face. Featured below these are additional snaps from @jmrampage of Jon's appearance at the launch party in Clutter Gallery! SWIPE thru above IG-slideshow to view a trio of Dunny designs each from Brandon "Bwana" Spoons and James Groman, with color variations of a singular sculpt from @bananapoons - who mentioned; "My first Dunny after all these years flirting with @kidrobot", while Groman manifested his illustrative details to his dino-Dunnies! 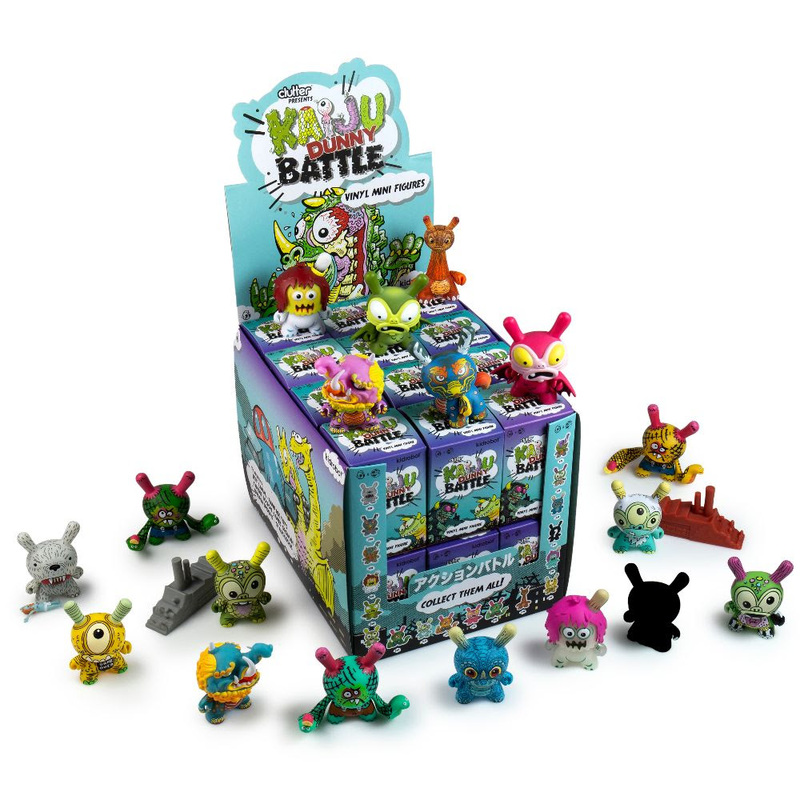 @jgroman60 adds; "From a early un-evolved time when Dunnisaurs ruled the earth, these three prehistoric creatures are stomping in as part of the Kidrobot x Clutter Kaiju Dunny Battle Mini Series". SWIPE thru above IG-slideshow to view Dunnys from Walter Jacott AKA Chauskoskis and Jeff Lamm! Its been a while since we've seen @chauskoskis in action - who mentioned jokingly; "It’s been a while but it’s nice not to mess things up with resin", and his sculpt for Lamm's Greasebat has become one of the more iconic in modern kaiju (as far as I'm concerned), so to see it now as a production piece, is exhilarating! BABY G had earlier been released as a custom-Dunny (circa 2014). 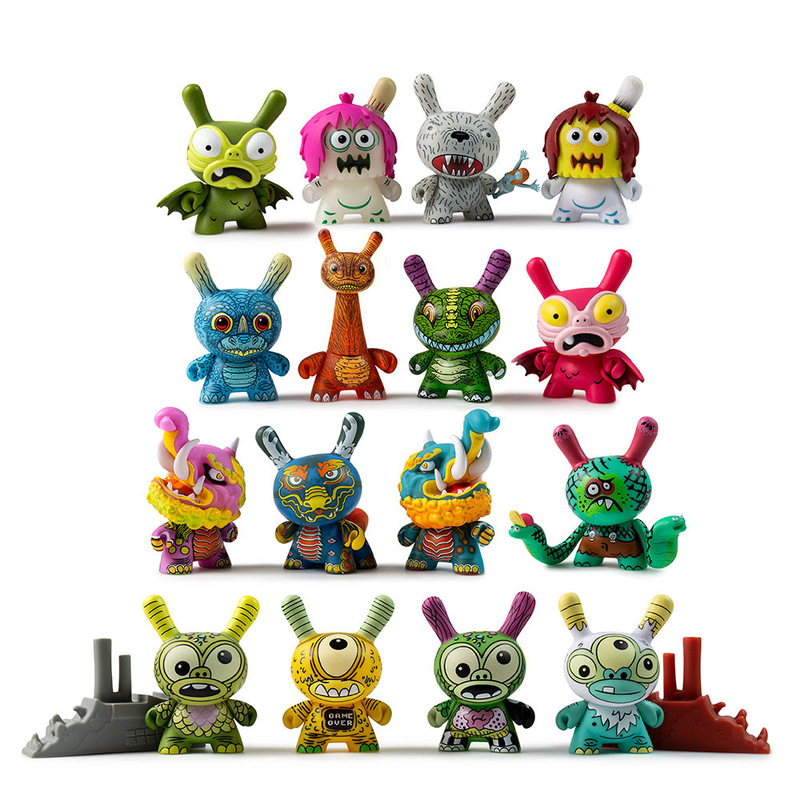 And I am thoroughly enjoying Lamm's "doodled"-styled designs of his regular character creations on the Dunny form, infusing it with a sense of "playfulness" that seems somewhat "missing" in these genre toys for far too long, IMHO. This could have been sculpted into the form, but then I'd be less inclined to "play" with a "masterpiece", innit? But that's just me ... Check out the additionally embedded snap from @greasebat featured below!